Lake Erie is the fourth largest lake (by surface area) of the five Great Lakes in North America and the thirteenth largest globally if measured in terms of surface area. 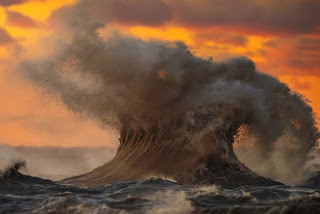 It is the southernmost, shallowest, and smallest by volume of the Great Lakes and therefore also has the shortest average water residence time. Lake Erie's northern shore is bounded by the Canadian province of Ontario, with US states of Ohio, Pennsylvania and New York on its southern and easternmost shores and Michigan on the west. 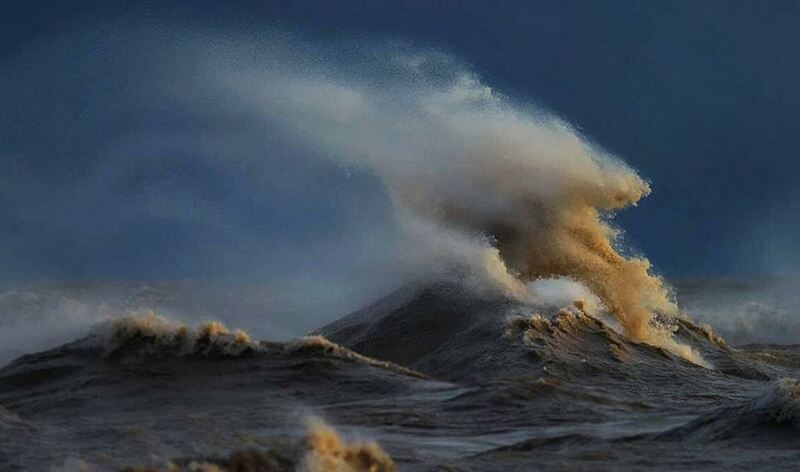 Looks like the ocean but it's the Great Lake Erie! 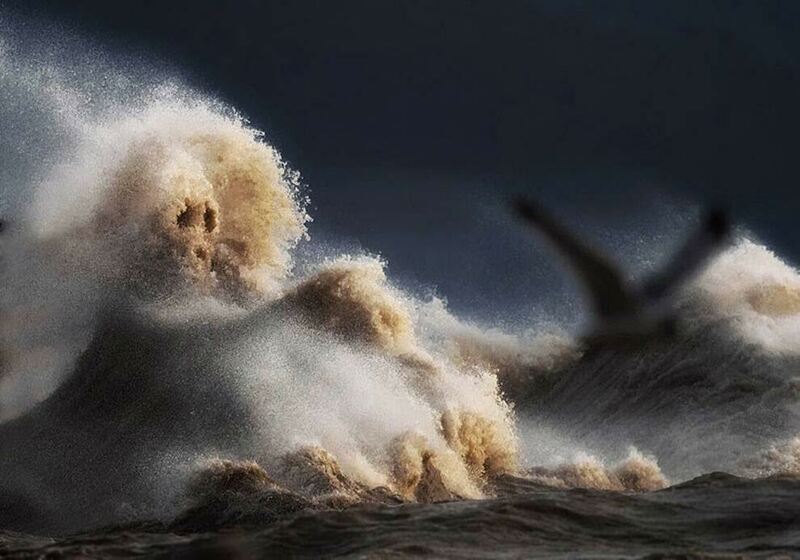 Notice the sand in the water being tossed about. 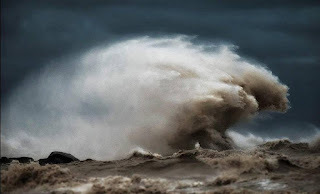 Dave Sandford recently spent time on Lake Erie shooting the Great Lake's turbulent fall season. From mid-October to mid-November, the longtime professional sports photographer traveled each week to Port Stanley, Ontario, on the edge of Lake Erie to spend hours taking photos. 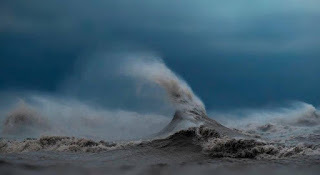 This series of images shows what this Great Lake looks like after the sunbathers and boaters leave and the weather begins to turn. 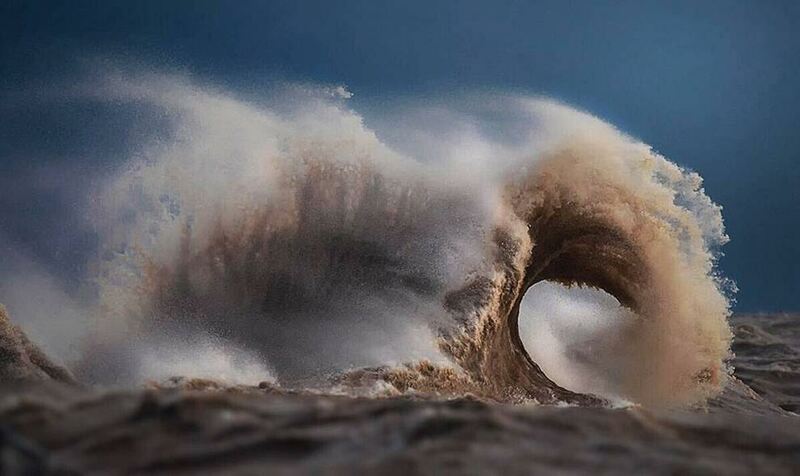 His goal was to capture the exact moment when lake waves driven by gusting winds collide with a rebound wave that's created when the water hits a pier and collection of boulders on the shore. 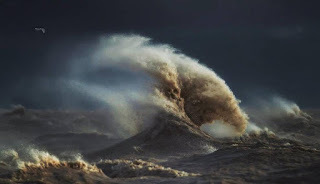 "The best way I can describe the water is it's like a washing machine. It's not like ocean waves, where you have a nice set that's rolling in. They are really erratic, they go all over the place, and there is a strong undertow there so it can be a very dangerous place." "I've had a number of people contact me that used to live by the Great Lake Erie and they said the photos really stirred something inside them because they grew up there and know what the water can be like." "I'm hearing from other people that are blown away. They say, 'This can't be a lake, it's got to be an ocean.' They had no idea that a lake could generate waves of this size and force." "The wave [in this photo] looks sort of like a mountain. I've already had it printed up for my own wall at home. These waves move so fast. 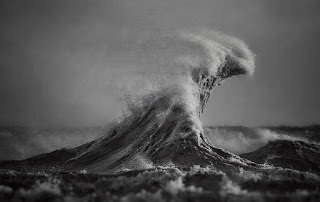 It's insane how fast they form, and then from the time that they form to that nice peak to exploding, it's a mere second." 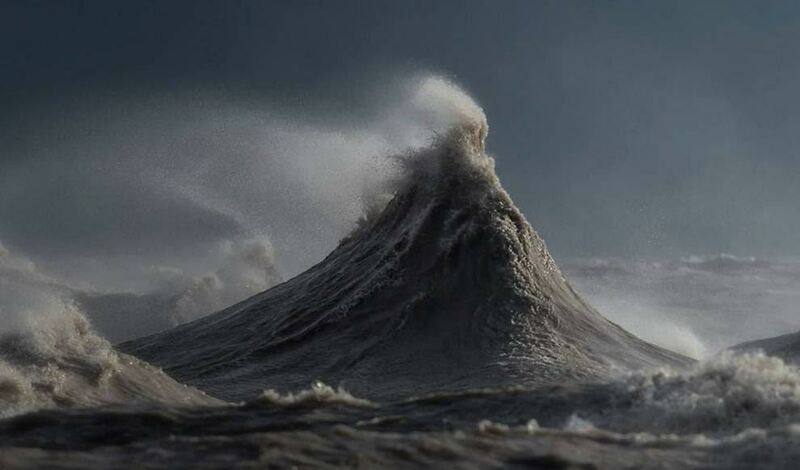 "I really enjoyed that challenge, when I was out there, of getting it when it's in that almost perfect peak on both sides before it explodes, so it has that look of a mountain or a volcano." "There was only one evening where the sun broke through. Most were very overcast days." "I enjoy the challenge of freezing things in time. Getting them at the right moment ­ at the peak moment." 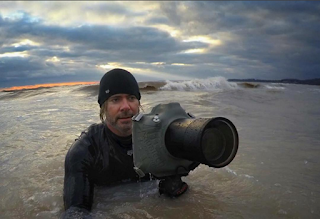 He said his sports photography and his waves series share one important characteristic. 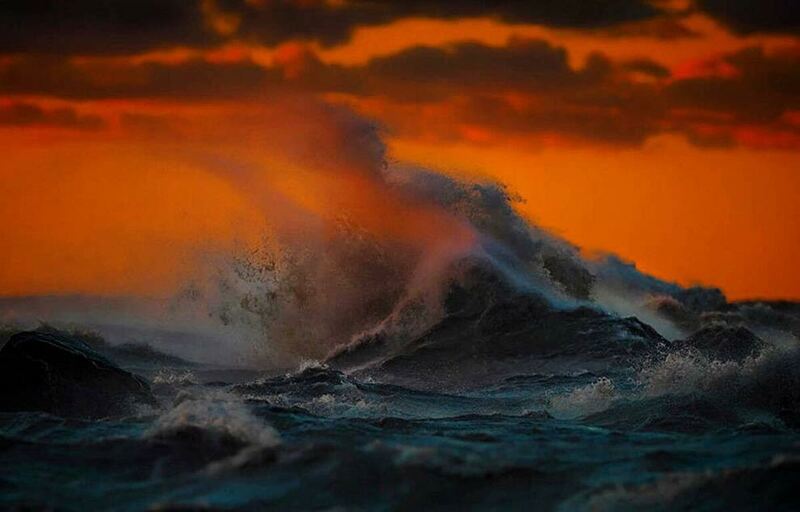 "In all the things I've made my living doing in photography there are no do-overs no re-dos. You get one shot at it and that's it, so it really helps you hone your craft." "When you're on a beach you don't have a studio setting where you can set something or someone up and have multiple opportunities to get it. It's one and done."